We’d love your help. Let us know what’s wrong with this preview of On Justification by Luc Boltanski. A vital and underappreciated dimension of social interaction is the way individuals justify their actions to others, instinctively drawing on their experience to appeal to principles they hope will command respect. Individuals, however, often misread situations, and many disagreements can be explained by people appealing, knowingly and unknowingly, to different principles. A vital and underappreciated dimension of social interaction is the way individuals justify their actions to others, instinctively drawing on their experience to appeal to principles they hope will command respect. Individuals, however, often misread situations, and many disagreements can be explained by people appealing, knowingly and unknowingly, to different principles. 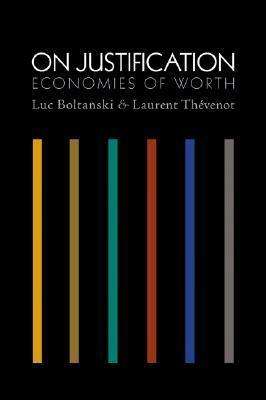 On Justification is the first English translation of Luc Boltanski and Laurent Thevenot's ambitious theoretical examination of these phenomena, a book that has already had a huge impact on French sociology and is likely to have a similar influence in the English-speaking world. In this foundational work of post-Bourdieu sociology, the authors examine a wide range of situations where people justify their actions. The authors argue that justifications fall into six main logics exemplified by six authors: civic (Rousseau), market (Adam Smith), industrial (Saint-Simon), domestic (Bossuet), inspiration (Augustine), and fame (Hobbes). The authors show how these justifications conflict, as people compete to legitimize their views of a situation. To ask other readers questions about On Justification, please sign up. Saatanan sosiologit. En ole ihan vakuuttunut siitä, että kaiken tarvitsee oikeasti ilmaista näin vaikeasti. Sosiologisen taloustieteen merkkiteos yhtä kaikki. This is one of those books that-oddly enough-one can relate to as much as it is eye-openning; making it as illuminating as it is relatable. It tackles how different worlds intersect and justify their encroachments on society using higher common good principles. Boltanski is regarded as one of the most influential French sociologists of the late twentieth and early twenty-first centuries. He was born on the 4th of January 1940 in Paris as a child of polnish Jews. His brother is the artist Christian Boltanski. He studied social sciences at La Sorbonne in Paris and published his dissertation in 1969. Then, he worked as professional academic in various organi Boltanski is regarded as one of the most influential French sociologists of the late twentieth and early twenty-first centuries. He studied social sciences at La Sorbonne in Paris and published his dissertation in 1969. Then, he worked as professional academic in various organisations like the École des Hautes Études en Sciences Sociales, the Centre de Sociologie Européenne, the Groupe de Sociologie Politique et Morale and the Institut de Recherche Interdisciplinaire sur les Enjeux Sociaux, where he currently is a member of. He also teached classes at universities all over Europe and the United States. In 2008, he delivered the Adorno lectures at Frankfurt. Boltanski is known as the leading figure of the ‘pragmatic’ tradition within contemporary social and political thought, or specifically, he is one of the founders of an approach that he himself calls 'pragmatic sociology of critique'. He challenges formulaic approaches in sociology and takes established, common problems in modern societies in new directions. He seeks to show how social reality harbours contradictions and how this enables social actors to modify situations. His sociology is recognized as theoretically original and methodologically innovative.